La Guardia landing gear malfunction: The Southwest flight wasn’t in great danger. But you should always fasten your seatbelt low and tight. Passengers were evacuated Tuesday from a Southwest Boeing 737 after a landing gear malfunction made for a rough landing at LaGuardia Airport in New York. 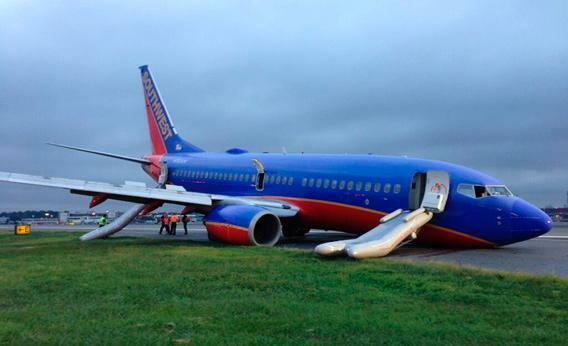 On Monday, a Southwest Airlines 737 suffered a collapse of its nose gear upon landing at La Guardia airport. Ten people were injured. At first I tried to ignore the story, hoping it would go away, but the mishap has the press in a bit of a frenzy, so I feel obliged to chime in. So it goes where there’s an airplane accident, no matter how minor, in the heart of the world’s hungriest and busiest media market. Malfunctions involving landing gear are exceptionally frightening to people. I guess this doesn’t surprise me, considering the average person’s lack of understanding of how planes fly. But in truth, while landing gear malfunctions are sometimes splendidly telegenic, rarely if ever are they going to end in catastrophe. Trust me, the need to circle while pilots troubleshoot a gear problem, as happens every so often, is no reason to go scribbling your last will and testament on the back of a barf bag. Some malfunctions are more serious than others—for example, the gear-up landing of a Boeing 767 in Poland two years ago—but in general, from a pilot’s perspective, they are well down the list of potential nightmare scenarios. First was the total unexpectedness of the malfunction. Reportedly the pilots had no indications that anything was wrong. The gear failed with no warning, leaving passengers and cabin crew unprepared. Granted, it’s the crew’s job to ensure seatbelts are properly fastened and luggage safely stowed prior to any landing, but it goes without saying that if the possibility of a gear-up landing had been known prior, the mindset of everybody on board would have been different. There also would have been time for the pilots to run their checklists and brief the rest of the crew and passengers on what to expect. The flight attendants would have reviewed their evacuation procedures and made sure everyone was ready. (Including themselves; passengers have said that members of the cabin crew were crying and unresponsive.) As the 737 fell forward onto its nose, some passengers reported hitting their heads on the seats in front of them. This could have been averted had people been instructed to brace themselves prior to touchdown. And rescue crews would have been able to get into position (along with the gawkers with their cellphones and cameras), ready to respond immediately to any fire or serious aircraft damage. Second, the gear collapse apparently caused the pilots to partially lose directional control. The plane veered and skidded to the edge of the runway, with an engine coming to rest in a grassy area. La Guardia is a small, busy, and heavily congested airport, with limited real estate between runways and taxiways. The chances of the 737 striking another plane weren’t high, but they were higher, perhaps, than would’ve been the case at many other airports. As it happened there was no fire, no spilled fuel, no collisions, and no serious damage or injury. Regardless of how unsurprising this was, some preparation is always better than none at all. The underlying lessons of this accident aren’t a whole lot different from those of the Asiana crash a few weeks ago. The odds of your being involved in an emergency are remote, but they are not zero. Don’t expect the unexpected, but at least be prepared for it: Keep your seatbelt fastened properly (low and tight, not lazily and loosely around your stomach). Know where the exits are and how to use them. And if there’s a need to evacuate, move quickly. And please, don’t go grabbing for your carry-ons. It’s not unheard of for an evacuation to cause more injuries than the emergency landing that precedes it. Those escape slides are very steep, and dragging your laptop or roll-aboard with you is reckless and unsafe. For the sake of everybody, leave your things behind!